As a parent we want nothing more than for our children to be safe even whilst at home. With the arrival of a new baby this means you will need to look at your home in a while new light. Babies and young children are naturally curious so it's always best to assess your home for any lurking dangers which could be prevented in the first place. 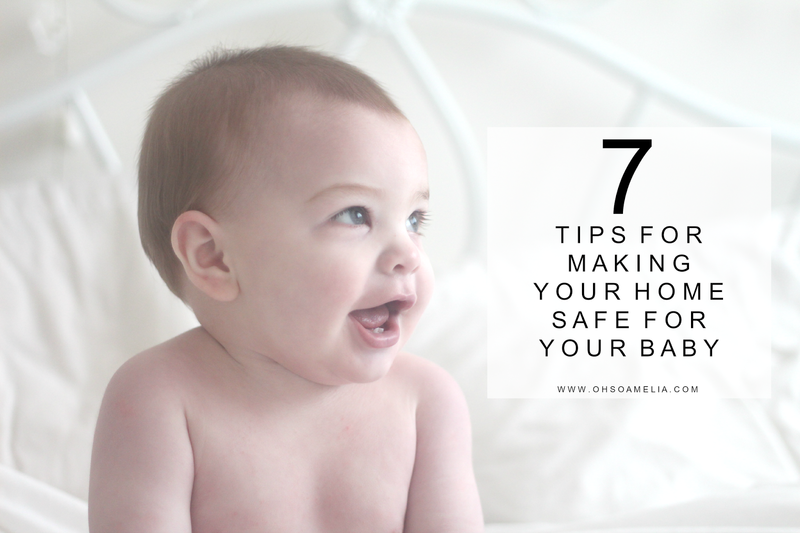 Which is why I've put together my top 7 tips for making your home safe for your baby. Panasonic's Smart Home device is the smart way to monitor your home to give you piece of mind and lets you use your smartphone whether you're out in the garden or cooking whilst your baby is sleeping or playing in their room. The camera will send alerts to a smart device through sensors whilst a built in speaker allows you to talk directly to anyone in earshot. When not in use as a baby monitor it can be used when you're away to keep an eye on your from any burglars. You can purchase the smart home indoor camera here and here's a short clip showing you what it can do. It's always a good idea to have an alarm system to prevent anyone from breaking and entering unauthorised. It's the best way to know if someone has tried to enter your home as the alarm will go off, especially if you're all asleep during the night. If you have blinds make sure that the cords and chains are out of reach by moving furniture and costs well away from any windows. You can also buy a blind safety device which allows you to keep any chains or cords out of reach. Although all blind sold in the UK after 2014 should now be cordless. If you have children it's advisable to secure any furniture to your walls to prevent it from tipping over especially heavy wardrobes, dressers and bookcases. Children like to climb things, climb in them, on them so at any point they could easily tip over. There are many safety straps and brackets on the market that you can buy to easily secure furniture to the wall. When you baby starts to get mobile and begins to crawls it's a good idea to install baby gates around the house. Depending on your house structure most parents install them at the top and bottom of the stairs and on the child's bedroom door, some even choose to put one on the kitchen door as well. Having baby gates installed also means you can open the back door to let in some fresh air without worrying that your child will escape. As your baby gets older and starts climbing furniture they may be able to get onto window sills or on top of furniture to reach a window. If you have any low windows it's advisable to keep them locked when not in the room and don't forget to remove the key. Window stoppers are also advisable to prevent your child opening the windows any further to avoid accidents. We all know that babies like to get into everything and once they are mobile there's not stopping them. To prevent any nasty accidents buy plastic guards for any sharp corners on coffee tables or furniture in the living room. Do you have any baby proofing tips to make your home safe for a baby? * This post is in collaboration with Panasonic. For details on how I work with brands take a look at my work with me page. Well this couldn't have come at a more perfect time! This week Isabella started crawling, so this weekend we're baby proofing the house! I can't believe we're already at the crawling stage - ahhh!! Fab tips as always Kerry. Baby gates are a life saver when your baby starts to crawl and climb! I am extremely excited about finding such information new to me and I am very happy when I can learn so much my first child. I was horrible about baby proofing my house when B arrived and I can't say I did any when MM came along shortly after. I am lucky to have them both all fingers and toes if I am honest as we didnt even use gates. But I think it's so important now looking back it was laziness and I should have took precautions. Here are some important tips for how to safe a baby home. Thanks for your most important post. this is really important to safe our baby. I will try to apply all. Child safety should be the first priority of the parents, but sometimes they didn't throw much attention as it should be. these 7 tips can really make this possible to save the kids from possible threats with ease. Many great tips here for kids safety. Baby gates are a life saver when your baby starts to crawl and climb! This is amazing. Indeed safety is an essential part of having a home. I love your idea on how to make the place more secure and private. Thanks for sharing this one.